by Bruce W. Halstead, M.D. What would you do if faced with a school of sharks in a feeding frenzy? 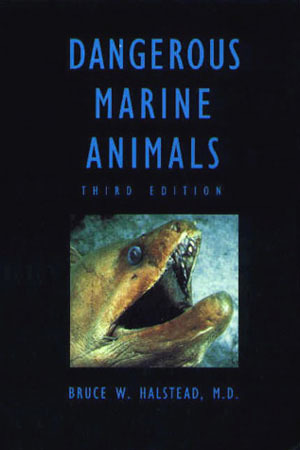 Find out in this book, unquestionably the most authoritative compact guide to the world of underwater animals that are poisonous, venomous, and electric. It is an excellent practical handbook for sailors, marine biologists, ecologists, naturalists, physicians, students, and scuba diversin short, anyone interested in the denizens of shallow marine waters and the deep. This new edition describes and fully illustrates these dangerous marine animals, their noxious effects, treatment of ailments resulting from them, and, most importantly, how to avoid mishaps. More than two hundred illustrations, including many color photographs new to this edition, show the animals in their true forms and in their natural habitats. Dangerous Marine Animals is the culmination of more than forty years of intensive research by Dr. Bruce Halstead, a renowned marine biologist/toxicologist, who has traveled and studied marine creatures in over 150 countries. Click the button below to add the Dangerous Marine Animals, by Bruce W. Halstead, M.D. to your wish list.